These estate grown vanilla beans are from the tropical island of Madagascar located in the Indian Ocean off the southern tip of Africa. I have long sourced these beans from our dear friend Buddy Born, - who also supplies us with our authentic Spanish La Mancha saffron - first for our restaurant many years ago and now for you. They are derived from a fragrant orchid, Vanilla Planifolia, with the long, slender fruit that takes 3 years to develop, then it is hand-picked and sun-cured for up to six months with much of the flavor and quality developing during this time. Over 70% of the world crop comes from this island...and because it is known throughout the culinary world for its unparalleled aromatic quality, the high demand is making prices skyrocket! Amazing fact…when Europeans first took vanilla cuttings and began to cultivate them in other tropical climates, they bore no fruit. They discovered that a small bee, the Melipona, was responsible for most of the pollinating of the vanilla orchids in Central America, and that these orchids would need to be hand pollinated to produce results. Today, vanilla everywhere goes through the intensive process of hand pollination, once the flowers appear. From this moment, it can take up to eight months to produce a mature long green vanilla bean for curing. It’s not hard to understand why the vanilla bean is the second most expensive spice in the world, saffron being number one! Vanilla is an indispensable seasoning in the kitchen...from ice cream, to rice pudding (see our recipe), crème brulee, custards and panna cotta…all are enhanced with these flavor-packed beans with their very high vanillin content. They also add a pleasant essence to crepes, French toast, poaching liquid for pears, or mixed with yogurt, mascarpone or ricotta with a swirl of honey. 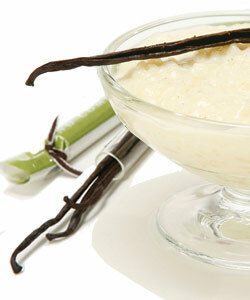 Store your vanilla beans in a cool, dark pantry well covered to maintain their moisture content. Do not refrigerate as it will dry out the beans. You can also 'recycle ' your beans by rinsing, drying and adding to a couple of cups of sugar. After a few weeks, you will have fragrant vanilla sugar to use in your coffee, and add to your cookie and cake recipes (1 tbsp. vanilla sugar=1/4 tsp. vanilla extract). We are offering you these long, black beans with their intense flavor and desirable moist, supple and oily skin (a sign of freshness and proper storage) in packs of 3 beans, about 7" each. They come in a glass vial, tissue wrapped, creating an ideal environment for storage. Madagascar grows/produces about 70% of the world’s vanilla crop so everything that happens there is reflected in the entire market. As demand for “real” and “natural” products has escalated around the world (a good thing! ), the price of vanilla has been creeping up for years. It is important to note that every single orchid flower must be hand pollinated since there are no native pollinators in the island of Madagascar…crazy! The good news is that growers and workers on the island have seen an increase in what they are receiving for the incredible hard work that goes into growing these extraordinary and tasty beans and it is clear that they are not going to give up this extra cash for their crop and thus prices are rising as demand increases and the growers demand more as well. Furthermore, those increases in prices took another big hit when Cyclone Enawo hit the island and further impacted the size of the crop. So in the end, increased demand coupled with a crop shortage have led to dramatic price increases.